The first part of a four-part series, Dr. Bill St. Cyr, Executive Director of Ambleside Schools International gives us the definition of joy: providing examples of what it is and is not, contrasting it with happiness, and establishing it as a foundation of character. The Method of the Lesson, as described by Charlotte Mason, is marked by five steps. Bill and Maryellen St. Cyr, of Ambleside Schools International, continue discussing the of the Method of the Lesson, describing the reading of an episode, narration, and the second talk. While the teacher points to ideas in the text, the children must do the work of thinking and learning. ”The children themselves must do the mental work. They must engage their minds - they must do the attending; they must do the reflecting; they must make use of the ideas. 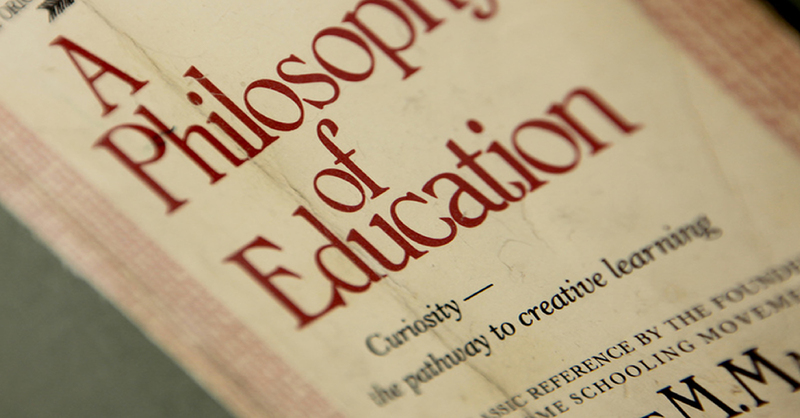 A renewing vision and philosophy of education must lead to an applied method. Bill St. Cyr of Ambleside Schools International discusses and gives examples of the first two steps of the 5-part Method of a Lesson used at Ambleside schools. It begins with a well-chosen text; this could be a book, a flower, or a musical composition. The relationship between the student and idea-rich texts is what Charlotte Mason meant by a living education. “Just as the human body needs nourishment and exercise to flourish, so the human mind needs the nourishment of ideas, but it also needs exercise. In exercising, the mind attends, it reflects, and it uses that which it is learning. Is the true goal of education to learn? Or is it to win a prize and impress others? “Build the character; build the love for learning; build the passion to know; build the discipline to work well – [and] all of that takes care of itself.” Ambleside Schools curriculum includes 16-17 subjects, following Charlotte Mason’s idea of the importance of giving children as many relationships as possible at the very beginning of their lives. Bill and Maryellen St. Cyr, of Ambleside Schools International, discuss how to direct students’ minds toward learning. “As a school, we’ve got to be very intentional about the kinds of relations we’re cultivating, and the kinds of ideas that are ceding those relations. How do adults effectively support children in habit formation? Habits are best cultivated in a relational manner that reflects genuine care; Charlotte Mason describes this relationship as the “friendly ally.” Adults have to lay down the rails, do the leg work, stand beside the child, remain consistent, always joyful to be with the child. Bill St. Cyr, of Ambleside Schools International, discusses how to cultivate a habit of humility, beginning with sowing an idea and building an alliance around an idea. How do we lift children above what is their nature? Charlotte Mason wrote, “Habits are to life as rails are to a train.” Bill St. Cyr, of Ambleside Schools International, discusses the role habit formation plays in the lives of individuals. “Charlotte Mason was a hundred years ahead of her time when it comes to her understand of how the brain functions. She knew that when a habit was formed, there was a change in the very grey matter of the brain. We now know much more clearly how that happens.” At Ambleside Schools, worthy habits, such as habits of kindness, attention, and careful work are intentionally and carefully formed in our students. How Much Does the Student Care? As you listen, use our study guides to assist you in making meaningful connections and increasing comprehension and memory. Artificial incentives communicate that it is impossible to enjoy history, mathematics, science and literature in and of themselves; we just endure these parts of education to appease the adults and get to the “good stuff”- pizza and a movie. Dr. Bill St. Cyr of Ambleside® Schools International discusses the sub-text implications of a reward based approach to work. Cultivating children’s tastes and directing their affections toward what is good, true, and beautiful begins with the development of deeply satisfying relationships with worthy literature, music, art, and more, as well as with a consistent habit of working well. “The atmosphere, the way in which work is talked about, the way in which work is engaged… that will communicate everything to a child about they will relate, how they should relate to work. In a place where hard work is normal, . . . where sweat is part of life, and when staying on task even when head and hand are tired is a good thing, a noble thing; it’s what we ought to do; that’s what we all do here,” children see work as a normal part of life. Charlotte Mason described the deeply satisfying nature of completing set work with excellence; this good and noble habit is cultivated in students at Ambleside® schools and homeschools. Dr. Bill St. Cyr and Maryellen St. Cyr of Ambleside® Schools International discuss the importance of setting an atmosphere that supports a noble approach to work. As you listen, use our study guide to assist you in making meaningful connections and increasing comprehension and memony. Cultivating a taste for the good and beautiful begins with setting the Atmosphere. Beautiful music, art on the walls, wooden furniture all play a part in setting the tastes of a child. Dr. Bill St. Cyr, of Ambleside Schools International, notes that children don’t innately know what is good, what they would like, but rather respond to what is in the Atmosphere. “She [an Ambleside student] had been introduced to beautiful music. Her natural appreciation for beautiful music had been cultivated such that when she heard something that was not beautiful, she was quick to recognize it. Masterly Inactivity is a peaceful presence held by the teacher that gently calls, invites, a child back to a strengthening of the will – to sit up straight or say a kind word, for example. Dr. Bill St. Cyr, of Ambleside Schools International, discusses the importance of Masterly Inactivity and the toxic effects of the “Heavy Handed” teacher. “The teacher is preserving peaceful, good, instructive, life-giving atmosphere, and the way she does that is by practicing what Charlotte Mason called Masterly Inactivity. The role of the teacher or parent in setting a classroom atmosphere of joy and order hinges on the nature of authority between the adult and the students. Does the teacher lead with an authoritarian or authoritative role? The authoritarian teacher leads by anxious and controlling means, setting an unpredictable and fragile atmosphere that squelches a student’s love of learning, desire for growth, and sense of joy and peace. The authoritative teacher, as described by Charlotte Mason in School Education, leads as a person authorized by another, with immovable fixed principles in all matters of importance. Proper authoritative leadership lives peacefully under authority and is moved only by responsibility and what is good and right; selfish wants and needs are quickly dismissed. At Ambleside® schools and homeschools, weakness is not seen as a disturbance, but rather as an opportunity for discipleship; “It is good to be me here with you. . . . We’re going to figure out a strategy to help you move in a more life-giving direction.” Dr. Bill St. Cyr and Maryellen St. Cyr of Ambleside® Schools International discuss the distinctives of a proper approach to authority in the classroom that fosters an atmosphere of joy, curiosity, exploration, learning, and peace. Atmosphere has a profound impact on setting our affections. Dr. Bill St. Cyr, Executive Director of Ambleside Schools International, discusses the atmosphere that supports the desire for working well, paying attention, and reading worthy books. Our affections are caught by the community we are surrounded by. “When you step into a classroom where everyone is paying attention, the easiest thing is to pay attention. Chapter 1: The Foundation of Joy from Ambleside Schools International on Vimeo. One of the most important responsibilities of a teacher is to set an atmosphere of joy in the classroom. The sense of joy is non-verbal, “in the air and breathed in” by the children – it’s what Charlotte Mason called Atmosphere. Bill and Maryellen St. Cyr, of Ambleside Schools International, discuss the difference between happiness and developing a deep sense of joy. Often when people visit Ambleside member schools, they say, “There’s peace here, a peacefulness, there’s a sense of expression here by the students and by the teachers that’s genuine, that’s full of delight, full of joy…. What We Draw Children With Is What We Draw Children To. Part 3: What Are We Drawing Students To? from Ambleside Schools International on Vimeo.